Stargazing is among the most peaceful and inspiring outdoor activities. Jonathan Poppele, author of award-winning Night Sky: A Field Guide to the Constellations, helps us take a look at Taurus, one of the Constellations of the Zodiac. For thousands of years, people have looked skyward and seen shapes within the stars. These shapes became the basis for constellations, which were associated with animals, mythological figures, and legends. Not surprisingly, many constellations have ancient origins. Most of today’s constellations stem from ancient Greece and the Middle East. This is largely thanks to Claudius Ptolemy, a Greek astronomer who lived in Alexandria, Egypt, during the second century AD. His famous book, the Almagest (Latin for “Great Treatise”), was a compilation of the astronomical knowledge of his time. Drawing upon the work of Aristotle and other Greeks, Ptolemy described 48 constellations and laid out a detailed geocentric (Earth-centered) model of the universe. The Almagest was the authoritative work in astronomy for 1,400 years, until the sixteenth century, when Nicolas Copernicus proposed that the sun, not the Earth, was at the center of the solar system. Galileo and other astronomers built upon this theory, leading to the eventual acceptance that the Earth (and the other planets) rotated around the sun, which was only one of many stars. The Almagest included all of the constellations of the zodiac except for Libra, which was added later. These constellations traced the progress of the sun during different times of year. The sun appeared to rise in the general vicinity of a specific constellation or “house” of the zodiac. These were not astronomically accurate and were only rough approximations of the sun’s position. Since the creation of the zodiac, the Earth’s axis has wobbled slightly (called precession). For these reasons, the traditional astrological dates are inaccurate. The correct dates, which are astronomically precise, include dates when the sun transitions from one constellation into another. These modern dates include a gap between Scorpio and Sagittarius; this occurs because the sun appears in a non-zodiacal constellation, Ophiucus, between them. TAURUS is most prominent from November through January and visible in the late evening sky from October through March. A prominent and well-known constellation, it is home to the two most famous star clusters in the sky, the Pleiades and the Hyades. Easy to find because of its bright star, Aldebaran, it does resemble the head of a bull with long horns. One of the constellations of the zodiac, it lies along the ecliptic and is often home to the moon and planets. Aldebaran is the brightest star in the constellation and the ninth-brightest star in the sky, Aldebaran represents the eye of the bull. Its orange-red color can be seen with the naked eye. 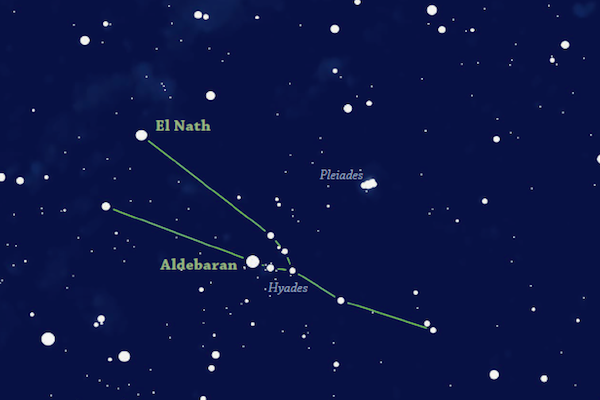 El Nath is the constellation’s second-brightest star and one of the 30 brightest stars in the sky. Hyades: A large, loose star cluster located just west of Aldebaran. Known since classical times, the star cluster is named after the five sisters of Hyas, a great hunter who died tragically. The weeping sisters were placed in the heavens, where their tears became rain. The most famous cluster in the sky is the Pleiades, easily seen with the naked eye. The view is spectacular with binoculars. Under good conditions, a person with very good eyesight can clearly see six stars clustered in a fuzzy patch about four times the diameter of the full moon. Binoculars clearly show the cluster’s six brightest stars to form a tiny dipper. At one time, the cluster was known as a separate constellation. It is one of three constellations mentioned in the Bible (Orion and Ursa Major are the other two). Named for the daughters of Atlas and Pleione, legend says that the sisters were placed in the sky to protect them from the incessant courting of the hunter, Orion. It is likely that Taurus was the very first zodiac constellation to be recognized, as it was associated with the start of spring in early human history. Taurus is associated with several Greek myths. It is sometimes said to represent the Cretan Bull that Hercules captured or the bull that sired the infamous Minotaur. Most commonly, these stars are said to represent Zeus himself, disguised as a white bull to seduce the beautiful maiden Europa. Europa was a noblewoman from the kingdom of Phoenicia. Zeus fell in love with her, but Europa’s father kept her closely guarded and would not allow any suitors to approach. Zeus transformed himself into a white bull and mingled in with her father’s herds. While Europa was out on her daily walk, she approached the magnificent bull. Struck by its beauty and gentleness, she petted it and climbed onto its back. Zeus took this opportunity, ran down to the sea, and swam to the island of Crete with Europa on his back. Once there, he revealed his true identity. Zeus made Europa the first Queen of Crete and gave her three gifts: a bronze guardian, a spear that never missed, and a hunting dog that could run down any game. She is considered the mother of Crete, and the continent of Europe gets its name from her. The constellation shows only the bull’s head and shoulders, as it depicts it swimming across the sea to Crete. If you enjoyed this post you also might be interested in how to locate the Pleiades and Hyades in the winter night sky.